A charity aid worker from Essex is preparing an attempt to travel across four continents on horseback. Anna Halford, from Colchester, will begin the ride in Chile in February along with her boyfriend Gilles Favier and their dog Delta. The couple flew to Chile on Saturday to begin training with their packhorses. The Médecins sans Frontières logisticians plan to then ride up to North America, Russia, Central Asia and Europe over the next three years. Miss Halford, a project co-ordinator with the emergency relief charity, said she did not think anything like this had been attempted before. SHAIKHA Maryam bint Ahmed bin Hamad Al Khalifa raced to victory in the National Day Endurance Horse Ride held yesterday. Riding Kattar, the Royal Endurance team member completed this challenging 120-km ride on top with a total ride time of four hours, 52 minutes and 22 seconds with an average speed of 24.627-km per hour. Behind her was Al Khaldiya Stable captain Shaikh Khalid bin Hamad Al Khalifa (5:11:10) in second place while Al Fateh Stable's Nasser Khalifa Abdulla (5:32:26) came third on Prince. More than 50 riders competed in the second event of the season, which took place at the Bahrain International Endurance Village in Sakhir. Open for senior riders, the ride was closely contested with some of Bahrain's top riders from various stables in the fray. The five-stage ride got underway with Shaikh Khalid, the Royal Equestrian and Endurance Federation president, taking the lead after the 30-km first stage in 1:11:50. He was followed by Shaikha Maryam (1:12:45) and Abdulla (1:21:34) who were second and third, respectively. No changes on overall positions were witnessed after the second stage, which was also over 30 kms, as Shaikh Khalid held on to his lead after completing the stage in 1:11:35 and an average speed of 24.150-km per hour. Shaikha Maryam (1:12:15) maintained composure to stay in second place, and Abdulla (1:21:57) remained third. Shaikh Khalid managed to keep his lead after the 25-km third stage, clocking 1:01:18 and ahead of Shaikha Maryam (1:01:23) and Abdulla (1:11:31) who were respectively second and third. But in the fourth stage, which was over 20 kms, Shaikha Maryam put on a superb show to take over the lead from Shaikh Khalid and finished the stage in 53 minutes and 36 seconds. Shaikh Khalid, who timed 1:01:16, slipped to second for the first time. An additional 85-km qualifier for inexperienced riders was also held yesterday. It was won by Royal Endurance Team member Abdulla Mohammed Al Arjani in three hours, 57 minutes and 15 seconds with an average speed of 21.496-km per hour. Second was Mohammed Abdulnabi Ramadan (3:59:20) of Al Fateh Stable while Nehat Singh (4:09:26) of Al Muntaser Stable rounded off the podium. The rides were followed by an awarding ceremony which was attended by Supreme Council for Youth and Sports chairman and president of the Bahrain Olympic Committee Shaikh Nasser bin Hamad Al Khaifa who honoured the top three riders in each event. The honouring ceremony was also attended by Breef Endurance Committee chairman Shaikh Daij bin Salman Al Khalifa who congratulated the winners and wished other riders success in future championships. A RUDGWICK teenager has had such outstanding success in her chosen equestrian discipline of endurance riding, that from 2012 she is likely to ride for Great Britain abroad. Katie Bedwin (13), who is a pupil at Farlington School, started on the winning trail in September when she won the Pony Club’s Intermediate Championship in Bedfordshire with her five-year-old Arab mare, Elayla. On the first weekend in October she competed in Wales in the home international team with her grandmother, Rosemary Attfield’s part-bred Arab, Burfield Red Dragon. There she rode 130km over two days and won a cluster of awards- Top Junior, Top Competitive Horse and the Golden Dragon Award, in the face of tough opposition from adults. Katie, who is a member of Endurance GB, the national body for the sport, is still at junior level in endurance, but her prowess against adults continued in the middle of October when she took Elayla to Braemore in Wiltshire and won the Southern Novice Championship against strong competiton from adult riders. This was just the start of an impressive winning trail of championships won before Christmas. 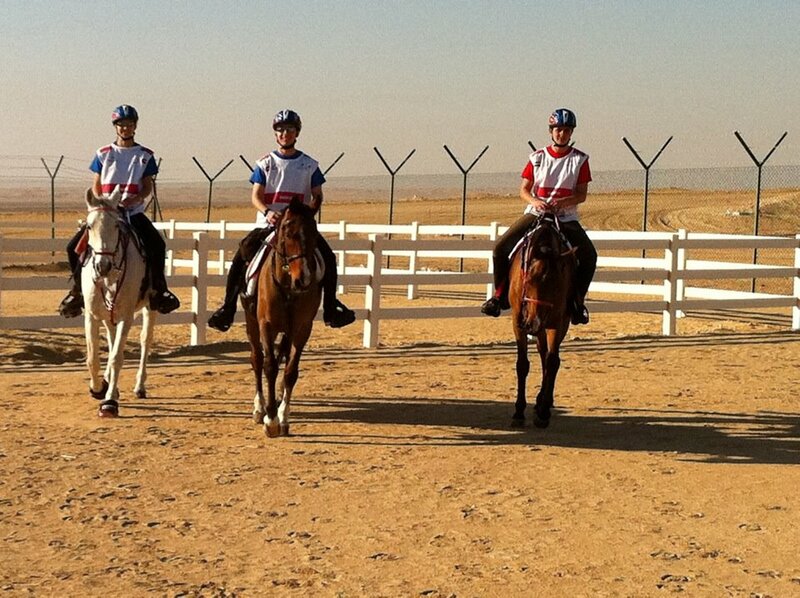 SOME of Bahrain's best riders have signed up for the 120km National Day Endurance Horse Ride starting tomorrow at 6am. 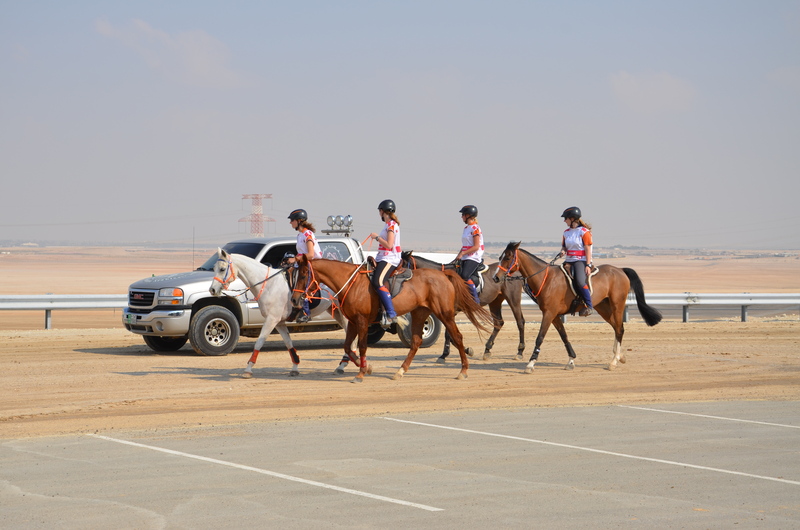 The event is being organised by the Bahrain Royal Equestrian and Endurance Federation (Breef) and is due to take place at the Bahrain International Endurance Village in Sakhir. This will be the second event of the 2011/12 season. The first event was held two weeks ago and was for the Breef President Cup. It was held over a total distance of 100 kms. Open for senior riders, this weekend's championship will be divided into five stages. The first two stages will be over 30 kms each, the third will be over 25 kms, the fourth over 20 and the fifth and final phase over 15 kms. Captained by Shaikh Nasser bin Hamad Al Khalifa, the Royal Endurance Team will head into tomorrow's ride as the No. 1 team. They had won the National Day title in the 2009 and 2010. The team, under their coach Yousif Taher, will be banking on several prominent riders, including 2009 edition champion Jaffer Mirza, and last year's junior category winner Abdulrahman Al Saad. Meanwhile, Breef president Shaikh Khalid bin Hamad Al Khalifa believes the competition in the new season will be fierce due to the increased number of participants and the noticeable progress the Bahraini riders have made in recent events. On his part, Breef general secretary and ground jury president Ghalib Al Alawi said everything was set for the event. He said the veterinary examination will take place today at 3pm and the event will be managed by a team of Bahraini juries for the first time this season. The 2011/12 season will also feature six more rides, including the Heavy Weight Challenge on January 7, 2012. This will be followed by His Majesty the King's Cup, the main event of the endurance season, scheduled for February 4. The Shaikh Nasser bin Hamad Al Khalifa Ride will then take place on February 18. The Breef Championship is due to be held on March 2, then His Royal Highness the Crown Prince Cup night ride will take place on April 6. The last event on the Breef calendar will be held on April 5 and is entitled "The End of the Season Ride". MARTIN Stirling was the star of the World Endurance Championship for Juniors and Young Riders in Abu Dhabi last weekend. The 15-year-old schoolboy led Uruguay to team and individual glory. The French stood in silver medal position on the team podium ahead of the Australians, who took bronze, but it was Victorian Allix Jones who was runner-up for the individual title. Firming up the dominant position of the Uruguayan squad at the biennial event, Oriana Ricca claimed individual bronze and teammate Maria Pereira took the Best Condition award after finishing seventh individually with Mi Jade. It was a surprise result all round. There were high expectations that riders from the United Arab Emirates would feature prominently after their convincing wins in 2009. It did seem the title might be in the UAE's grasp again on Saturday, as Sheik Khalifa Bin Mohammad Al Hamad led throughout the third and fourth stages and looked the rider to beat. However, despite a three-minute lead going into the final 16km loop, he and his horse, Ultimo, dropped to fifth at the end of the day. For Stirling, who was accompanied by his parents, two brothers and his baby sister, and by Magdalena Odriozola who owns his winning ride, Vendaval, it was a spectacular achievement. "I was confident," he said afterwards. "I wasn't far behind the leading horse in the second-last loop and my horse was in good shape when I went into the last 16km." Manama, Dec. 21 (BNA) -- THE Bahrain Royal Equestrian and Endurance Federation (Breef) has stepped up its preparations for the National Day Ride on Saturday. It's the second endurance ride of the 2011/12 season. The inaugural event of the year took place two weeks ago and was for the Breef President Cup, which covered a total distance of 100km, this was published at GDN. Saturday's event, to be staged at the Bahrain International Endurance Village in Sakhir, will be over 120km with some of the kingdom's best riders expected to take part. Among the participants are the the Royal Endurance Team, captained by Shaikh Nasser bin Hamad Al Khalifa, which is the top favourite stable. Royal Endurance Team had dominated the previous ride, winning all three podiums. This event will only be open for senior riders. Shaikh Nasser highlighted the upcoming event, which marks the Bahrain National Day celebrations and His Majesty King Hamad's accession to the throne. The Royal Endurance Team leader said the National Day Championship is one of the major rides in the season and features gruelling competition among participants. Following this weekend's ride, the federation will then prepare to organise the Heavy Weight Challenge on January 7, next year. His Majesty the King's Cup ride, the main event of the endurance season, will then take place on February 4, to be followed by Shaikh Nasser bin Hamad Al Khalifa Ride on February 18. The Breef Championship is scheduled for March 2, and then His Royal Highness the Crown Prince Cup night ride will be held on April 6. The End of the Season Ride will then be held on April 5. Doha: The UAE dominated the endurance riding competition at the 12th Arab Games in Doha, winning all three individual medals as well as team gold yesterday. His Highness Shaikh Mohammad Bin Rashid Al Maktoum, Vice-President and Prime Minister of the UAE and Ruler of Dubai, was in attendance to watch his son, Shaikh Hamdan Bin Mohammad Al Maktoum, Crown Prince of Dubai and the President of Dubai Sports Council, help the UAE team to victory. Shaikh Hamdan was awarded the silver medal after finishing alongside Yousuf Al Beloushi, who claimed gold. The bronze was won by Sultan Al Maamary. They were joined by Ali Ganem Al Merri, Ali Khalfan Al Jahouri and Mohammad Ahmad Al Subose in the UAE team that swept aside all competition in the 120km endurance ride. Al Beloushi finished the first stage leading the pack riding Shardell Prince Valiant in 1hr 11min 34sec, followed by Shaikh Hamdan on Muhannad in 1:11.48, Al Maamary in third on Dudleydick TE in 1:12.06 and fourth-placed Al Merri on EO Rakam in 1:12.09. Uruguayan wonder-boy, 15-year-old Martin Stirling, rode the nine-year-old Vendaval to Team and Individual gold at the FEI World Endurance Championship for Juniors and Young Riders 2011 in Abu Dhabi on Saturday. Abu Dhabi hosted the FEI World Junior Endurance Championships over the weekend where Australia and New Zealand were both represented by teams. The Young Riders Representing Australia in the World Youth Endurance Championships were Alexandra Toft and High Society te; Brooke Warner and Kunama Safira; Georgia Toft and Bremervale Arrogance; and Allix Jones and Castlebar Moonlight. New Zealand was represented by a team of four competing on their own horses - Tessa Deuss, Emma Mason, Sian Reid and Georgia Smith. All the horses were fitted with electronic head collars, so live results were available for each loop/phase (five loops in total) of the ride. The winning time was 5 hours, 18 minutes and 51 seconds by Martin Stirling of Uruguay. Congratulations to Australian team member Allix Jones riding Castlebar Moonlight, who did an outstanding job and finished second in the fantastic time of 5 hours, 19 minutes and 3 seconds. Individual silver medallist, Allix Jones, was less than a minute behind with Castlebar Moonlight whose average speed was 22.567kph. And it was a moment to savour for the horse's owner, Margaret "Meg" Wade, one of the great heroines of equestrian sport who won the FEI's "Against All Odds" Award, but missed out on the presentation at the 2011 General Assembly in Rio de Janeiro last month when her flight to Brazil was cancelled. Meg's extraordinary recovery and return to the saddle after the multiple champion suffered a traumatic brain injury in a fall two years ago has been nothing short of inspirational. Aussie Brooke Warner finished 16th with a time of 5 hours, 59 minutes and 52 seconds and Alexander Toft finished 37th. Unfortunately Georgia Toft's horse Bremervale Arrogance was vetted out in phase three. The Australian team did brilliantly and ended up in third place overall, out of 17 teams. Best placed New Zealand Junior was Sian Reid and AA Sabatage in 28th place with a time of 6.42.21, closely followed by Tessa Deuss and Aspen Hills Santa Ana in 36th place with a time of 6.52.42. Georgia Smith and her horse Glenmore Astroid rounded off the New Zealand results in 42nd place with a time of 7.10.20. Emma Mason and Taralea Sheer Illusion were unfortunately vetted out pre-ride. The New Zealand team put in a great effort and placed sixth overall. There were 77 individual entries in total, so both Australian and New Zealand young riders did a fantastic job. HorseHage-sponsored endurance rider, Jeni Gilbert, and her Connemara pony, Flurrie, have triumphed at the recent annual Endurance GB Awards. The pair took the titles of Senior and Supreme Champion as well as winning the Veteran Trophy and awards for the Best Unregistered Horse and Best Endurance Ride Results This Season. They were also runners-up for the Best Team award (four horses) and the Best Three Endurance Ride Results and achieved their 6400km award for successful competition. This is the second time Jeni and Flurrie, who are based near Huddersfield in Yorkshire, have been crowned Endurance GB Supreme Championship and is a brilliant achievement for both horse and rider as Flurrie is now sixteen-years-old and is a native breed competing in a sport dominated by Arab horses. Rochedale equestrian rider Stephen Gray will head to New Zealand without his horse on January 26 for an endurance horse-riding event. Gray will represent Australia in the 160km Trans Tasman endurance race in which the host nation supplies horses to its visitors. Gray has competed in endurance events since 2000 after taking up the sport for interest and falling in love with it. From his semi-rural property he maintains nine horses, devoting much of his time to providing them with special attention as well as training and preparing for competitions. ``Endurance riding is a major growing sport in Australia and overseas, as is evidenced by the growing number of horses and popularity of equestrian sports throughout Australia, particularly in areas close to the city,'' he said. On this occasion, however, he will be training and riding a New Zealand horse unknown to him which will add another dimension to his competition riding. During his 12 days in New Zealand attending the Trans Tasman Event in the South Island of New Zealand, he will encounter extremely difficult and rugged terrain, which will test the stamina of both horse and rider. LYME’S Kirsty Wiscombe continues to defy the odds. Last year the endurance rider finished as the top British rider in the FEI World Open Endurance Rider Rankings just 12 months after recovering from a life-threatening illness. And now, having won the Mirwart FEI World Veteran Rider Championship, the 41-year-old has begun another bout of rehabilitation after having both hips replaced. Reflecting on the past year, Wiscombe said: “I have had a mixed season. “Unfortunately I have struggled to ride most of the season due to severe osteoarthritis in my hips. “However, Eskar, my 11-year-old pure bred gelding, has been fantastic and despite me being in a lot of pain he has looked after me all season. “He has done two FEI one-star rides and two FEI two-star rides. “For my final ride of the season I returned to Mirwart in Belgium and despite being in pain and having to be helped on and off Eskar, I had a fantastic ride. Even though our National Endurance Championships are a few months away, 6 - 8th April 2012, the OC is thrilled to have conformation of ‘Velvet Pure’ taking Major Naming Rights for our leading event on our National calendar. Some serious work behind the scenes has resulted in ‘Velvet Pure ‘having confidence to invest into our event. This 100% New Zealand owned (based in Darfield – North Canterbury) company is only into its very early years of development. Taking the stag by the antlers (so to speak) will be a very large commitment for them. Deer Velvet has been prized by the Chinese people for over 2000 for its powerful health promoting properties. Deer Velvet contains 32 amino acids, minerals, glucosamine and chondroitin. These ingredients are naturally occurring. Velvet Pure produces this nutritional dietary supplement not only for humans (VelHealth) but for Equine, Canine & Feline too. Benefits to name a few, supports the body’s immune system, helpful for stress and fatigue, assist with strength and endurance, helps support anti -ageing. Their $6000.00 investment will see a range of their products made available as prizes a cash injection that will help the running costs of this major event. Velvet Pure will also sponsor a first time entrant in the National CEI Championship 160km ride to the value of $150, a new idea being trialed at both Sth Is & National Champs this season. Martin Stirling was the star turn at the 2011 FEI World Endurance Championship for Juniors and Young Riders in Abu Dhabi over the weekend when the 15-year-old schoolboy led Uruguay to Team and Individual glory. The French stood in silver medal position on the team podium ahead of the Australians who took bronze, and it was Australia's Allix Jones who was runner-up for the Individual title. Firming up the dominant position of the Uruguayan squad at this biennial event, Oriana Ricca claimed Individual bronze while team-mate, Maria Pereira, took the Best Condition Award after finishing individually seventh with Mi Jade. It was a surprise result all round, with high expectations that riders from the United Arab Emirates would feature prominently. The UAE's Hussain Ali Al Marzouqi steered his horse, Sergai, to win the last FEI World Endurance Champion for Juniors and Young Riders held in Hungary in 2009, while Ahmad Ali Al Sabri and Alizee de Marjolaine claimed the Open category gold at the European Junior and Young Rider Endurance Championships in 2010. It did seem that the title might well be in the UAE's grasp once again on Saturday, as Sheikh Khalifa Bin Mohammad Al Hamad led throughout the third and fourth stages and looked the one to beat. But, despite a three-minute lead going into the final 16kms loop, he and his horse, Ultimo, dropped to fifth at the end of the day. "I was confident" he said afterwards. "I wasn't far behind the leading horse in the second-last loop and my horse was in good shape when I went into the last 16kms." A total of 28 nations were represented at the event - Argentina, Australia, Austria, Brazil, Canada, Chile, the Czech Republic, Ecuador, Spain, Estonia, Finland, France, India, Italy, Mexico, Namibia, The Netherlands, Norway, New Zealand, Oman, Poland, Portugal, Slovakia, Sweden, South Africa, Uruguay, the USA, and the host country, the UAE. Teams were mainly comprised of four riders, with the scores of the best three taken into account. Competitors arrived early last week and the opening ceremony took place at the Emirates Palace on Wednesday evening. The next day they took a trip to the Desert Safari Dinner, and on Friday horses underwent the pre-ride veterinary examination. The 120km race was run over five loops of 33kms, 27kms, 24kms, 20kms and 16kms. 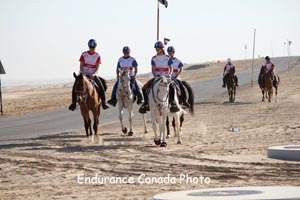 The action, staged by Adec, kicked off at 6.30 on Saturday morning at the Emirates International Endurance Village in Al Wathba, and the course proved considerably more difficult than many had anticipated. "The track was certainly challenging", said Ian Williams, FEI Director of Non-Olympic Sports who attended the event. "It included relatively flat going, but also a lot of sand dunes and local forestation - some sections were quite demanding. It was a real desert ride, with horses going from level terrain into deep sand in the dunes, so it called for clever riding and good technique from all the competitors" he explained. The completion rate of over 60% was impressive, as was the average speed of 22.581kph achieved by Stirling's horse Vendeval, who was a polo pony in a former life, and who looked as happy as his young rider as they crossed the line after 120kms of tough sport in a total riding time of 5 hours, 18 minutes and 51 seconds. Individual silver medallist Allix Jones was less than a minute behind with Castlebar Moonlight whose average speed was 22.567kph. And it was a moment to savour for the horse's owner, Margaret "Meg" Wade, one of the great heroines of equestrian sport who won the FEI's "Against All Odds" Award, but missed out on the presentation at the 2011 General Assembly in Rio de Janeiro last month when her flight to Brazil was cancelled. Meg's extraordinary recovery and return to the saddle after the multiple champion suffered a traumatic brain injury in a fall two years ago has been nothing short of inspirational. Bronze medallist, Oriana Ricca, completed the course with Hunter Toro in five hours, 35 minutes and 25 seconds and at an average speed of 21.466kph, fractionally faster than Argentina's Manuela Basombrio and Tio Langa. The Uruguayan team victory was a convincing one, when Stirling, Ricca, Pereira and Juan Pablo Viana (Larkeena Del) completed with a total time of 16 hours, 35 minutes and 53 seconds, almost a full hour ahead of the French silver medal-winning side that included Nina Lissarrague (Al Jaime De), Lea Vogler (Al Abjar), Julien Lafaure (Petra Cabirat) and Lisa Riou (Favela), whose average speed was 20.538kph as opposed to the winners' 21.707kph. Australia's bronze medal finish was all-the-more impressive for the fact that this was only a three-strong side - Jones joined by Brooke Warner (Kunama Safira) and Alexandra Toft (High Society Te) to complete in 18 hours 14 minutes and at an average speed of 19.964kph. Talking afterwards about the test they had faced, the champions from Uruguay explained that their plan was always to work as a team and to concentrate on taking a team medal, so the individual success was a major bonus. "We were not expecting to finish first and third individually!" they said. The French declared themselves pleased with team silver. "We prepared our horses for the desert and the sand, but we didn't expect that the course would be so difficult", they said. The Australians declared it "a great course", and agreed that it had been a strong test. "We thought it would be flat, and not very technical, but actually it turned out to be very challenging. We thoroughly enjoyed it, it was a great competition!" they enthused. The result may well have changed the face of international Endurance riding, with the next generation of senior riders from the South American countries very much to the fore as they claimed five of the top eight places in the Individual rankings - Ecuador's Rafaela Darquea steering Tequila into eighth place. And Martin Stirling is certainly a name to remember. He rode with maturity well beyond his years, and only showed his emotion as he crossed the winning line with tears in his eyes and a big smile on his horse's face. "To win the Team and Individual gold was really fantastic!" said the delighted young man who enjoyed the ride of his life. Team: GOLD - URUGUAY 21.7078, Vendeval (Martin Stirling), Hunter Toro (Oriana Ricca), Mi Jade (Maria Pereira), Larkeena Del (Juan Pablo Viana); SILVER - FRANCE 20.5383, Al Jaime De (Nina Lissarrague), Al Abjar (Lea Vogler), Petra Cabirat (Julien Lafaure), Favela (Lisa Riou); BRONZE - AUSTRALIA 19.9644, Castlebar Moonlight (Allix Jones), Kunama Safira (Warner Brooke), High Society Te (Alexandra Toft). Individual: GOLD – Vendeval (Martin Stirling) URU 22.581; SILVER - Castlebar Moonlight (Allix Jones) AUS 22.567; BRONZE - Hunter Toro (Oriana Ricca) URU 21.466. KUALA LUMPUR, Dec 12 (Bernama) -- The Sultan of Terengganu, Tuanku Mizan Zainal Abidin, who ends his term as the 13th Yang di-Pertuan Agong today has recorded a string of sterling achievements. Tuanku Mizan was the first Muslim head of state to step foot on Antarctica last month after His Majesty made a five-day working visit to the research station at Scott Base located in the southernmost continent on Nov 20 to 24. The visit was held in conjunction with Malaysia's accession to the Antarctic Treaty, 1959 on Oct 31 this year, which among others, enables Malaysian scientists to be directly engaged in all research undertaken on the continent. Malaysia's assent to the Antarctic Treaty also made it the first Southeast Asian country and first Islamic nation to accede to the treaty. Tuanku Mizan who was among the youngest Malay rulers to ascend the throne as the Sultan of Terengganu, aged 36, in 1988, was the second youngest Yang di-Pertuan Agong after Tuanku Syed Putra Syed Hassan Jamalullail when he was chosen as the 13th Yang di-Pertuan Agong on Dec 13, 2006 at age 44. Tuanku Mizan, 49, as the Supreme Commander of the Malaysian Armed Forces was also the first Yang di-Pertuan Agong to take a flight in a fighter jet, the Sukhoi SU-30MKM at supersonic speed which was faster than the speed of sound, for about 45 minutes over Pulau Langkawi and Penang, where he visited the Royal Malaysian Air Force base in Butterworth on Feb 7, this year. On March 10, His Majesty went into KD Tunku Abdul Rahman, Malaysia's first submarine, which made a maximum depth dive for an operation in the South China Sea, as well as carrying out simulation fire on targets from the Scorpene submarine. Tuanku Mizan who is known for his humility, spent a day with the crew to experience life in a submarine. During his reign, Tuanku Mizan also helped to strengthen relations between Malaysia and other countries. Apart from receiving the visits of foreign leaders, he also visited several countries including in the Asean region, and Kuwait, Qatar and Uruquay. He also made special visits to the United Kingdom, United States and Canada. For Prime Minister Datuk Seri Najib Tun Razak, he was very grateful to Tuanku Mizan in all his dealings with His Majesty. "Under His Majesty's reign, state matters were smoothly conducted. The King's support is also highly appreciated by members of the Cabinet," he said at the banquet held in conjunction with the end of Tuanku Mizan's term as the 13th Yang di-Pertuan Agong at Istana Negara, here, on Saturday. Najib also expressed his appreciation for Tuanku Mizan's entire reign as Yang di-Pertuan Agong, and that the government and people were proud of His Majesty's concern for the people, apart from being active in charity work and sports. Information, Communications and Culture Minister Datuk Seri Dr Rais Yatim in his speech said that during the five-year reign of His Majesty, Malaysia continued to progress from one level to another higher level. "All the policies and practices under the 1Malaysia concept proved fruitful under Tuanku's reign and it is hoped that the nation will continue to prosper," he said. For Datuk Paduka Maharaja Lela, Datuk Awang Kechik Abdul Rahman who had served for more than two years with Tuanku Mizan as the Agong, said His Majesty's tenacity should be an example to every citizen of the country. "The King has repeatedly reminded the people to protect the good relations between the races, and to practise mutual respect and cooperation for harmony to prevail in the country," he told Bernama at Istana Negara recently. Awang Kechik said Tuanku Mizan had devoted his full attention to the people when each invitation involving the people was always fulfilled. Tuanku Mizan married Raja Permaisuri Agong Tuanku Nur Zahirah in 1996 and the royal couple is blessed with two princes, Tengku Mohammad Ismail, 13, and Tengku Muhammad Mua'az, 11, and two princesses, Tengku Nadhirah Zahrah, 15, and Tengku Fatimatuz Zahra', 9. Tengku Mohammad Ismail, the elder son of Tuanku Mizan, was appointed as Acting Sultan of Terengganu following the appointment of his father as the 13th Yang di-Pertuan Agong. Tuanku Mizan who is active in sports, especially in endurance horse riding, had spent time to participate in several competitions such as the World Endurance Challenge for the World Endurance Championships organised by Yayasan Diraja Sultan Mizan (YDSM), Equestrian Association of Malaysia (EAM), Federation Equestrian International (FEI) and Penn Endurance & Equestrian Club (PENN)). The King had also participated in the Sheikh Mohammed Rashid Al Maktoum Endurance Cup competition in Dubai in January 2008. Lexington, KY - The U.S. finished fourth among 19 teams Saturday in Abu Dhabi, UAE, at the FEI Junior and Young Rider World Endurance Championship despite an uphill battle that included an injured horse at the first inspection. "What an exhilarating team effort and realistically an unexpected result - but privately hoped for," said Chef d'Equipe Emmett Ross. Unexpected, in part, because Natalie Muzzio's horse Khalil Asam was not able to ship, resulting in the loss of Team member Steven Hay. Then, at the first inspection on Friday, Kyle Gibbon's horse, Misu Koran, owned by Stephen Rojek, presented with a sore shoulder and was not able to start. There are five vet checks throughout the race to check the horse's soundness and metabolic capacity in order to be allowed to continue. The three remaining Team members - 16-year-old Kelsey Russell (Willison, FL) on Gold Raven, 17-year-old Mary Kathryn Clark (Eatonton, GA) aboard Cheryl Van Deusen's DA Al Capone, and 18-year-old Kelsey Kimbler (Aberdeen, SD) on Kirsten Kimbler's Cody Canuck - would all need to finish the course to post a team score and rank as a team (aggregate total time of three riders score as a team). All three U.S. Young Riders did just that, with Russell and Valerie Kanavy's Gold Raven, a 10-year-old Arabian mare, finishing sixth individually in 5 hours, 37 minutes. "But everyone here - riders, mentors, families, crew, and staff were positive throughout," Ross said. "As Chef I had to try to have the riders understand that their task had many levels of responsibility for the team to accomplish a respectable team result - finish well with each horse giving it's all." Abu Dhabi: It still had not sunk in for the Uruguayan teenager, who kept playing with his two-year-old sister even as journalists threw questions at the new junior world endurance champion. Martin Stirling, 15, scored a huge win for his country with gold in the individual event, and also made a big contribution to the team's victory. "My horse Vendaval is a great horse and all credit goes to him," said Stirling, whose parents along with his two brothers and sister were all there to celebrate with him. "I have come second on Vendaval in the junior championship in Uruguay but to win here in the UAE is good. "In the final loop I just concentrated on my horse and towards the end the Australian rider gave me a hard challenge." Stirling's win was the second for Uruguay in the Junior World Championship, their earlier victory coming in the 2006 event in Argentina. AL WATHBA // Martin Stirling gave his family, who had made the long trip to the UAE, two reasons to celebrate yesterday with victory in the FEI World Endurance Championship for Young Riders and Juniors. The 15 year old from Uruguay rode Vendaval to win the 120-kilometre race, and then helped the South Americans take the team gold at the Emirates International Endurance Village. The biennial championship drew 79 riders from 29 countries and 48 completed the race, which was run over five loops of 33km, 27km, 24km, 20km and 16km. Stirling guided the nine-year-old bay gelding to victory ahead of Australia's Allix Jones on Castlebar Moonlight. Oriana Ricca, his Uruguayan team member, took bronze on Hunter Toro. "It was a very fast-run race," said Stirling. "The weather was nice and cool but the track was difficult, particularly the first three loops with some sharp climbs and downhill trail, and some deep sandy areas to negotiate. "Having come out of the toughest stages, I was confident. I wasn't far off behind the first horse in the second last loop. My horse was in good shape when I went into the last 16km and then went all out. "To win was a great achievement and to win the team gold as well was really fantastic ... To win the world junior title in the UAE is my biggest and most memorable." Stirling's parents, his two brothers and baby sister travelled with him along with Magdalena Odriozola, the owner of Vendaval. Abu Dhabi: Fifteen-year-old schoolboy Martin Stirling led a ‘Latin Delight' as riders from South America turned in a dominant display to stun favourites UAE in the World Junior and Young Riders Endurance Championship here yesterday. Stirling won the individual gold and led his Uruguay team to gold to complete a perfect double while team mate Oriana Ricca finished third, Argentina's Manuela Basombrio was fourth, Uruguayan Maria Pereira seventh and Rafaela Darquea from Ecuador next to him to complete a memorable championship for Latin America. It was heartbreak for the UAE's Shaikh Khalifa Bin Mohammad Al Hamad, who led in the third and fourth stage but his horse Ultimo, despite a three-minute lead going out into the final loop of 16kms, could only manage a fifth place. Stirling, on Vendaval, did well to first overtake the UAE rider and from then on keep his nine-year-old bay gelding in front despite a late challenge from Australian Allix Jones. Winner Martin Stirling from Uruguay finishing the white loop during the World Endurance Championship for young riders and juniors championship at the Emirates International Endurance Village in Al Wathba yesterday. Stirling's team mate Ricca finished third on Hunter Toro and with Maria Pereira in seventh the Uruguayans added the team gold to the individual gold. With 77 riders from 29 countries starting at 6.30am in the five-loop race, the UAE riders looked to be in good positions midway through the 120km event. But after Ali Ganem Al Merri's exit in the second loop, Mohammad Saeed Al Faresi also went the same way in the third loop. as we all have to finish to finish a team. came in a couple of days ago to round out a great team. about 9 hours earlier there -- so while you are sleeping, we'll be riding. Good luck team USA ! Only thing that could have possibly made this trip better is if Kyle and Steven were riding. This is one heck of a group here! Wish us luck !!!!! Team USA is set to go in the mornig for the race in the morning. Unfortunately one of the horses was not quite right and did not pass vet in. Kyle and Steve have been so much fun to have around and help this week. Thank you for everything! The race starts at 6:30 a.m. which is 9 hours ahead of eastern time. Out to the barn at 4 a.m. Go Team USA!! I just wanted to take a minute to say thanks to everybody following Kelsey & Cody on their big adventure. In addition to those at home and our endurance family we have a really great group of people here helping us and getting us ready for this race. They all keep reminding us that this is just another ride and to remember to have fun and do the best they can! Thanks everybody! All members of the team and crew have arrived including Carl, Camey & Tessa. Tonight was a great party in the desert. Tomorrow we vet in at 2, so lots of last minute details in the morning. (We are ten hours ahead of the central time zone.) The race starts at 6:30 am on sat. So that will be like 8:30 pm central time friday night! Long busy day preparing for the race tomorrow. Veto in is today at 2:00pm, 6 hours from now. Summer is looking great!! The Team is doing Great and working very well together. Last night was an outing to the desert... had told Ariel MacLeod a few days ago that she was not to ride one of the road side camels untill after the race, but if we found a tourist type camel that she coulds... we they had camel rides at the event last night :). All my worring about the road side camel ride was nothing compared to the drive from the bus to place where the event was... 4x4 through the dunes at high speeds, fish tailing, going close to other 4x4's and fences, being on two wheels.... OMG and guess who was thrilled with the trip... for thoes who know me well you know what the trip was like for me. Will post from the vet in this afternoon. Sand, sand, sand etc. But i'll never get bored here! So much to say and so little time to say it! Once this is all over I will go over all of the posted photos and flesh them out with a little explanatory text, but for now a few updates will have to suffice. The big news as Maura just posted is that our mare got through the first inspection with flying colors . She got all A's and her pulse was a very low 32..this after a long windy walk into new territory and being the only horse by herself waiting for the US to vet through prior to aloowing Canada's sole entry into the very hectic and crowded vet gate area. Canada and US are in the same quarantine barn together so we moved back and forth together and I was able to see the US horse's trot as well and for my money Summer had by far the best trot. Unfortunately for the US one of their 4 riders was eliminated for lameness and will not be allowed to start. What a huge disapointment after coming all this way! Our barn quarantine man "Osama" has taken a particular fondness for Summer and has given her an Arabic name "Al Anoud" which is apparently the name of a very famous racemare and although I can't find an online translation he says it means beautiful mare. Now that this process is done its going to be a difficult night to sleep for what few hours we will be allowed. There is a rider's meeting at 7 pm followed by a Vet meeting then dinner then getting up in the wee hours to prepare for a 6:30 am start. Apparently the first 2 loops are very technical with alot of deep sand so the horses will need to go slow but after that it becomes more of a speed course. We are allowed to take a 4X4 onto the course in designated areas where we will be allowed to get ahead of Ariel and Summer and pass relay style a bottle of open water to Ariel in motion with which she can drink and pour water over Summers neck. Dehydration of horse AND rider can happen since the wind cools you and makes you feel dry and comfortable meanwhile you are cooling thru the evaporation of sweat that hasn't had time to form on you so you don't feel hot or sweaty. WE got rid of building tension and anxiety last night with an evening trip to the desert for dinner and entertainment. After a long bus ride we were loaded into SUV's and were taken kamikaze style through the dunes at breakneck speed experiencing what appeared to be one life-threatening manoever after another and I came very close to wetting my pants! You know you have had an extreme experience when there are people waiting at the other end asking you if you are OK when you get out. There were drinks and a cash bar then a buffet and free hooka pipes called "shishous" sp which actually contain various flavored tobaccos and after 32 years of being an ex-smoker I actually shared a black licorice one with Tara and it was delicious and fun. Didn't taste remotely of tobacco and smelled beautiful and luckily I have absolutely no interest in doing it or any other tobacco ever again. Next there was a belly dancer who after doing a couple of numbers invited people on stage and before long it turned into one big fun dance party! Ariel was surprised that there was another side to me than the "stick" that she is used to (meaning me) and I told her that if she knew me when I was her age that she would be surprised that I am even alive today. Yes you too can overcome a rough teenagehood especially if you get into horses! After the dancing they sent us back through the dunes with a little less dramatic flair and then a bus ride home where people from all nations chatted amiably together and friendships were struck. I forgot to mention the Camel rides which I chose not to participate in but I was fascinated by their conformation and anatomy. The camels that get down and up alot have huge callouses over their elbows stifles and breast bones. When they go down the lean forward on their elbows and slowly stretch their skinny little hocks behind and land on their stifles and breastbones. The party did serve to tire us out and hopefully we do get some sleep tonight and have a positive day tomorrow. There are many more pictures out there and as I said I will try and tell you a bit about them after this is all over. So wish us well and godspeed to Ariel and "Al Anoud"
Abu Dhabi: After a few excursions and Wednesday night's gala welcome party, riders from around the world now have to prepare for a severe desert test at the FEI Junior and Young Rider World Endurance Championship tomorrow. More than 75 riders from 29 countries will be battling it out for individual as well as team medals in the 120km event, which will be held at the Emirates International Endurance Village in Al Wathba. Event director Adnan Sultan Al Nuaimi told a press conference here yesterday that all FEI officials, both technical and veterinary, had arrived and the stage was set for the UAE's third staging of the event after 1998 and 2005. Taleb Daher Al Muhairi, Secretary-General of Emirates Equestrian Federation, said: "The UAE will be looking to win this event as we are the defending champions in the individual event. "Our four riders have prepared well and we are hoping for another good performance to maintain our status as a leading endurance nation." Fahad Ali, representing the Abu Dhabi Sports Council, said: "This is another world championship that Abu Dhabi will be staging. "In fact we have three world events this weekend in three different disciplines and this augurs well for the future of Abu Dhabi as a sporting destination." The young riders, aged between 16 and 21, will tackle five different loops, including the demanding ‘Tora Bora' hilly section. Foreign Technical Delegate Derek Liebenberg said: "Normally in the open rides the ‘Tora Bora' is part of the penultimate loop, but Saturday's field will tackle that in the second loop itself. "This will get the young riders to negotiate the difficult part and then go for some pace on the final two loops. "Another important feature of this year's championship is that the rider and horse had to qualify together in one ride. "Earlier riders used to just come and sit on horses that have qualified separately. While this has reduced the number of entrants, it has also enhanced the quality of the event. "Climate-wise the riders from Europe and the West will not face many challenges, but the desert terrain will be a new challenge, though most of them have trained in such terrain before coming here." Teams will be represented by four riders, the three best times counting. The countries represented are: Argentina, Australia, Austria, Brazil, Canada, Chile, Czech Republic, Ecuador, Spain, Estonia, Finland, France, India, Italy, Mexico, Namibia, The Netherlands, Norway, New Zealand, Oman, Poland, Portugal, Qatar, Slovakia, Sweden, South Africa, Uruguay and hosts UAE. Written by Yara de Boer at 5:00 p.m. I would love to tell you how it is here, how we all experience .. but it is so hard! Stabbing people on the highway, newspapers are sold at the roundabout, melons are sold along the highway and the people are so nice here! I actually feel quite at home .. In the morning there grooms left for the horses to feed them, water measuring, stables and fattening them in check. All four top they look out! Also they were very excited when they were in the barn .. when we (the riders) arrived we left the desert to walk with the horses. The further we went into the desert, the happier they were. It's hard to describe what it does to you, if you see the horses so enjoy! In the afternoon two hours near the stables. For example, the horses rest and we can eat. Many fruits, but also many sweet, haha! In the afternoon we prepared the horses for horseback into the desert to go before the first ride! A quiet ride and a half hours, the horses motion. In the distance we saw something that was growing. It was a herd of camels who met us on our route. The horses had to let this sink in before she decided to go around .. The horses are very happy, feeling strong and just want to walk! It is so special for the first time on your horse to move after they have made such a journey. Then we looked after them, and yes .. they face with a blanket on the night! Best fresh then. At night, began the opening ceremony at the 'Palace' in Abu Dhabi. What big, beautiful and lots of luxury that was! In the courtyard were the riders of each country behind his own flag. In our music we walked round a show then followed with a bird on horseback, dancers and a speech to invite us for dinner. And of course that was also delicious! It was also nice to have some time to bring the others to speak. You're all working towards the same goal. This morning again grooms the horses went for the same reasons as the previous day. Sometime later, we arrived the riders and the horses went into the desert to ride, but this time for two hours. The horses were fit! We drove more and did more with the horses so we have a round can run as much and as beautiful sand! It's just sand, but am definitely not boring. We looked in our eyes, while we had our hands full with the horses, so feel good! After the ride we washed them for the inspection tomorrow. After lunch, the horses are Trimmed and a few grooms for the horses went to walk with them. The riders stayed at the hotel for us to prepare for the contest. What, who, how in the vetgate etc, and still like to sit quietly. Something for the first time this week. And it tickles all, we want to horses! See how the horses enjoy ..
idea what to expect! So quickly, quickly gather everyone. Word fun! Kyle is doing Great !! Great ride today ! He is having a blast ! Practiced his French today with the French team ;) Forest had fun at the camel tack store , today they went to dubai today to a very fancy stable ;) Steven is having the time of his life too ! it seems as if a fair amount of trails used here, the sand is grated and raked and gets quite hard, seems as hard as pavement. Opening Ceremony at the Emirates Palace Hotel....NICE! Yesterday before opening ceremonies a few of us got to go to the beach, what a beautiful sight/feeling. The sand was super white, and the water as clear and blue as ever. This morning Team Canada will get down and dirty clipping Summer, I'm sure we will see black hair everywhere!! Rode today with the team. All horses are looking great. After that my mom, Mr. Steve, Kyle, Forest, Steven, and I went to the world's 3rd largest mosque which we finally arrived at after getting slightly turned around. I can offically say that I have been in the desert and got stuck in a car.But it didn't take to long to get and unstuck and we were back to driving the course. Drove the first 2 loops. Tonight we had a desert dinner where I rode a camel, ate dinner, talked with some friends, face planted in the sand trying to come down it on a snowboard lol, and much more.Vet in tomorrow at 2 o'clock and the USA is first to vet. GO USA!!! ABU DHABI (UAE) (KNHS) - The four young riders who ride for the Netherlands in the Endurance Championship on Monday arrived in Abu Dhabi. Their horses have arrived one day later and the journey by plane successfully passed. The participants are now preparing the ground for the event over 120 km (CEI4 *). This will be held on Saturday, December 10th and goes through the whole desert. The World Championship in Abu Dhabi is a championship for riders up to 21 years. The Dutch team consists of four combinations: the 18-year-old Marijke Visser (Soest) with Eomer, the 19-year-old Joyce van den Berg (Leiden) with the Bass Cardonne, Fenne Koppenol (Grathem) with Valesco and Yara de Boer (Winterswijk Woold ) with Sumaya G. Because Fenne and Yara since the age of 21 years have achieved for them the last time they may reach a Championship for Young Riders. Yara de Boer drove alone already (twice) before an international championship. Riders and horses for the first time Wednesday afternoon riding in the desert, among the camels. The horses felt well. On Wednesday, the official opening of the impressive Palace by Adnan Sultan Saif Al Nuaimi. The start list has 83 participants from 30 countries. Netherlands riding for a good team classification. For a place in the country rankings, three of the four combinations well to the finish line. The Dutch team is supervised and supported by national coach Emile Docquier (Stavelot, B) and team vet Ben Horsmans (Selfkant, D.). The main area of ​​the Emirates International Endurance World Championship is the Village in Al Watbha. Friday afternoon, December 9th is there for the veterinary inspection occurs. On Saturday, December 10th at 6:30 in the morning (local time), the participants start. Abu Dhabi is three hours ahead of the Netherlands. The route of 120 km consists of five loops, ranging in distance from 16 to 28 km. The vetgates between the various routes take 30-40 minutes. During these breaks, the horses are always veterinary inspection. The ceremony included the awarding of the prize for Best Condition on Sunday, December 11. There are both individual and team medals to distribute. Alex Luque Moral, riding Koheilan Kinscso, won the Raid Barcelona- Santa Susana on December 4 2011. It was the 59th running of the 2-day 200 km ride. The Emirates Palace Hotel so so so so beautifull ...... and gold glitter where you look ..... ONGELOOFLIK! Ferrari World... mega nice place...fast cars... went on worlds fastest roller coaster! Not sure if too many people realize this, but one of the US horses, Cody Canuck is Canadian bred! So we have two Canadian horses competing at the YR World Champs! Rode all the American horses this morning. Al was wonderful and read to go. I love that horse. It has been an amazing last few days here in Abu Dhabi. Beautiful weather, Horses and riders doing great ! Yesterday we went to several Camel sauks (pretty much a racing Camel tack shop) Today We went to the worlds fastest roller coaster. Of course all this after they ride and we spend tons of time at the BARN !!! The team went out on their first training ride today in the desert. It was sunny and hot! Wide open trails with car driving along. A little different then what we are used too! After a full day at the barn the OC treated us to a private party at Ferrari world...home to the worlds fastest roller coaster!!!!!! Really fun day! "The Raid junior Spanish team, current European bronze medalist, has departed from the airport to Abu Dhabbi Liege, where on Saturday December 10th will take place on Junior World Championship in the discipline, in the International Endurance Village, Al Wathba of Abu Dhabi. A total of 120 miles in extreme desert plain in its entirety that are absolutely for our riders and horses. Up to 33 countries have announced their attendance. Yebra Quico convened to represent Spain's Champion Maria Ledesma with Us-Hamir, Marc Oliva with Jep Embaucadora, Gil Bereguer with Lucero Miki and Mariona Naranjo with Tra Clica, while this last horse has not been authorized to take Emirates flight to Dubai by the authorities, who have not been given good permits the Generalitat de Catalunya and the Directorate General for Agriculture and Livestock. " YOUSEF Nasser yesterday steered Al Jared to victory in the Shaikh Khalid bin Hamad Al Khalifa Ride, the inaugural event of the 2011/12 endurance horseride season. The first event of the season, held at the Bahrain International Endurance Village in Sakhir, was over 100 kms and open for private stables. The Al Asayel Stable rider completed the four-stage event in four hours, 35 minutes and two seconds, with an average speed of 21 kms per hour. Behind him was Al Mugheirat Stable's Nasser Awad (4:37:30) with an average speed of 21 kms per hour. Securing third place was Nasser Khalifa (4:40:42) of Al Fateh Stable. He also had an average speed of 21 kms per hour. All three riders received a brand new vehicle, donated by Bahrain Royal Equestrian and Endurance Federation President (Breef) Shaikh Khalid bin Hamad Al Khalifa, at the awarding ceremony. A side ride for seniors was also held. It was won by Abdulrahman Al Saad (4:09:40) of the Royal Endurance Team. Second place was won by Yousef Nasser (4:35:02) of Al Asayel Stable while Awad Nasser (4:37:30) of Al Mugheirat came third. Both rides were divided into four stages. The first two stages covered 30 kms each, the third was over 25 kms while the fourth and final stage was over 15 kms. In the main ride, the Royal Endurance Team dominated the show with three of their members leading the first stage. Gordon Singh came on top at the end of the first stage, crossing the finish line in one hour, nine minutes and 44 seconds. He was followed by Al Saad (1:09:49) in second place. Somer Singh (1:11:03) finished third. In the second stage, Al Saad took over first position from Gordon after completing the stage in 1:13:59. Gordon (1:13:14) went down to second while Somer (1:16:53) was third. In the third and penultimate stage, Gordon made a major leap by moving up to first place, finishing the stage in 1:04:50 following a fierce battle with Al Saad (1:05:22) who dropped to second. Abdulrahman Al Ali of Al Asayel Stable climbed into third place in 1:15:29. The event was flagged off by Breef general secretary Ghalib Al Alawi in the presence of Breef first vice-president Shaikh Faisal bin Rashid Al Khalifa and other officials. The Royal Endurance Team members were congratulated by their captain Shaikh Nasser bin Hamad Al Khalifa after the awarding ceremony. Shaikh Nasser, the Supreme Council for Youth and Sports chairman and president of the Bahrain Olympic Committee lauded the efforts of the organisers. On his part, Shaikh Khalid said the rides were exciting and lived up to expectations. Meanwhile, the next event on the federation's calendar will be the National Day Ride, set to take place on December 24. It will be followed by the Heavy Weight Challenge on January 7. His Majesty the King's Cup ride, the main event of the endurance season, will then take place on February 4. The Shaikh Nasser bin Hamad Al Khalifa Ride will then be held on February 18. The Breef Championship is scheduled for March 2, to be followed by His Royal Highness the Crown Prince Cup night ride on April 6. The season is due to conclude with End of the Season Ride, scheduled for April 5. Ariel MacLeod of Montney, BC, will represent Canada at the FEI World Endurance Junior & Young Rider Championship, which will take place on December 10 in Al Wathba, Abu Dhabi, in the United Arab Emirates. MacLeod, 17, will ride Cairos Summer Romance, a Canadian-bred nine-year-old black Anglo-Arab mare owned by MacLeod’s mother Tara Macleod, over the 120 km race. With 129 competitors representing 33 nations, this CH-M-E-JYR 4* competition is certainly a premier international event on the endurance circuit. Team Canada Veterinarian, Glenn Sinclair, DVM, left on December 2 to be in Abu Dhabi to meet Cairos Summer Romance on her arrival. MacLeod and her grooms, Tara MacLeod and Joan Harris, traveled on December 3 with Team Canada chef d’équipe, Maura Leahy. Abu Dhabi: Over 60 riders from 29 countries will be competing in the 120-km FEI Junior and Young Rider World Endurance Championship to be held at the Emirates International Endurance Village in Al Wathba this Saturday. Speaking to Gulf News, Adnan Sultan Al Nuaimi, Director General of the Abu Dhabi Equestrian Club who is the Event Director for the championship said, "Saturday's 120-km event is being held by the Adec and the Emirates International Endurance Village. Quite a few teams have already arrived and we are in top gear preparing for this junior world championship." The UAE, which has many endurance rides for juniors, will be among the favourites for a medal in both the individual as well as team categories. Arrived in Abu Dhabi today. All US horses travelled very well and look great. Several members of our team have landed in Abu Dhabi today. My 6 hour layover in Amsterdam turned out to be wonderful. Melody Blittersdorf and I met up and took a train down town and did some sightseeing. It was very early in the morning and was also a Sunday, so nothing really open yet. I think Melody has a short video to share. We did come across one little bakery that was open and had the ovens running. We sat down and enjoyed a nice Dutch latte and a traditional Christmas pastry called "oliebol". Kelly Kimbler and Kelsey Kimbler were also reunited with us in Amsterdam and flew together the final 6.5 hour leg to Abu Dhabi. The Canadian Chef d'Equipe was also with us. A few of Spain's young riders were also on our flight. At the hotel we had dinner with Cheryl Van Deusen, Mary Katherine Clark, Lori Shifflett, and met up with Emmett and John Crandell as well. The Mafraq hotel is very nice and the food delicious. I ordered the Morrocan Braized chicken with dates and cinnamon sticks. News is the horses are all looking wonderful. Can't wait to go to the barns in the AM. Barns open up at 8:00 AM and are a brief 20 minute drive away. 12:17 AM here, good night! We are here! This beautiful tile work ceiling greeted us as we got off the airplane. We have checked into our room and the horses are checked into their stalls. Well I got here last night and Summer this morning and hopefully the rest of the team and my luggage will also get here this evening. Nothing like 2 days of travelling followed by a day in the desert without a change of clothes..lets change the subject. The mare is amazing! We did bloodwork upon arrival and she looks ready to race and the rest of her physical exam is remarkable. I was going to g...ive her "rehydration therapy" supplied by the treatment vet and he said to me that he would not give her fluids as she is obviously adapting and that we might in fact interfere with the process. That and combined with the fact that our 4 tentmates from the US were about to go for a handwalk leaving her alone changed my plans as we are only allowed in the quarantine area from 8-noon and 2-6 so there was yet another reason to hold off. After she dragged me around the desert in front of the US horses and handlers she had a good roll in the sand paddock behind the tent and then seemed back to her quiet content self. There are hundreds of camels training in some of the same areas as our training areas are and tonight they were out in throngs...some jogging some camelled(ponied) some with heavy blankets on some with muzzles and often one big one being ridden witha bunch of small ones in tow..I think they must race them young like TBs hope to check out the Camel racetrack as well as a million other things this week. In any case so far we are in good shape with our equine competitor and after the the other team members get here and get a couple of days to adjust we should be in good shape...unless of course my luggage does not arrive. Hoping to pass this journalistic baton to somebody else tomorrow and I apologize for any errors as I am too tired to go over it. I arrived at 8pm this evening (well last evening) and was picked up along with the others that were expected at the same time - thanks Glenn for paving the way. Met up with Kelly, Kelsey, Kyle and Melodie in the Amsterdam airport, was great to see some familiar faces. At the moment only 2 people allowed in the barn at one time, this will apparently changing tommorw and thoes with accreditation will be alllowed into the barn starting tomorrow. We are finally in Abu Dhabi. And although it's 2:30 in the morning here Joan mom and I are bright eyed and bushy tailed, ready to go see miss summy in a few hours! Some issues with influenze records will prevent Steven Hay and Khalil Asam from representing the USA in Abu Dhabi in the Young Riders/Juniors World Endurance Championship. He will, however, be there to support the USA team. The rest of the USA horses are en route and should arrive in Abu Dhabi today. December 1, 2011, Abu Dhabi, UAE~The 40th National Day Celebration by the UAE gave special meaning to the win of Sara Al Jaber riding Highland View Dolly at the 100km Her Highness Shaikha Fatima Bint Mubarak Ladies Endurance Cup ride, held at the Emirates Endurance Village on Friday. Sian Reid and Georgia Smith have now joined the rest of the NZ Junior World Championship Team in Abu Dhabi. Andrea Smith and I went out to the airport at 5.15am to meet the girls, unfortunately the Navigator lady took them for a little tour then they went around the car park three times. They eventually got on track and picked up the girls safely. The two girls had their first run on the desert sands and were pleased to see their horses again. The team then took a walk up Mt.Nikolai with Sian and Tessa jogging some of it. There were great views from up there. After a long day first day and the new arrivals were tucked asleep early. There is not a lot else happening only the Aussies and us at the base at present. The first contingent of the NZ FEI Junior/Young Rider Endurance Team and their horses left NZ this week for the World Championships being held in the UAE. Everyone has arrived safe and sound, feed had been a bit of a problem when they first arrived however this has been sorted now. The horses arrived looking very well considering they had a 10 hour stopover in Singapore, Team Vet Nick Page and Chef d’Equipe Kevin James did a great job of looking after them on their long journey. The team has a great routine in place now and drive out from their hotel at about 6.30am to head to the stables which is about a 50 minute trip. Once there they then muck out, walk or ride the horses then head back to the Mafraq or somewhere else for lunch. Then at about 2.30pm its back to the stables and walk the horses out again. The horses have seen the camels in the distance and AA Sabatage was not at all keen on them. The Australians arrived yesterday with 6 horses. They have put their flags up now so we are all settled into our respective homes and the first two teams here.